Both of my grandmas use dish cloths. My mom uses dish cloths. It's only natural that I reach for the dish cloth over the sponge too. This post is about the Scotch-Brite™ Scrubbing Dish Cloth, which has two unique sides. One side acts as a cloth to wipe and dry without scratching. The other side features scrubbing dots that allow you to take on tough messes in the sink and across a variety of surfaces. This must-have is fully washable, reusable, and sturdy, and it takes cleaning to a whole new level. It is The Dish Cloth. Reinvented. One of the messiest foods I ever make is bacon. Grease seems to appear on my hands, counter, and oven before I even know what's happening. The mess is especially excessive when I make sweet and spicy bacon, which just so happens to be the most delicious bacon in the world. Since I've discovered the Scotch-Brite™ Scrubbing Dish Cloth, I'm much more inclined to make a batch of it! With bacon, splatter is inevitable, but the scrubbing dots make quick work of the grease, even after it's dried. This sweet and spicy grease is extra special though--it's sticky too, thanks to that glorious caramelized brown sugar. Never fear, this dish cloth takes care of it! I still had to soak my wire racks a bit, but with the help of a darn fine dish cloth, clean-up was pretty much a breeze, which is good news because that means I get my reward of sweet, crispy, spicy bacon that much sooner. 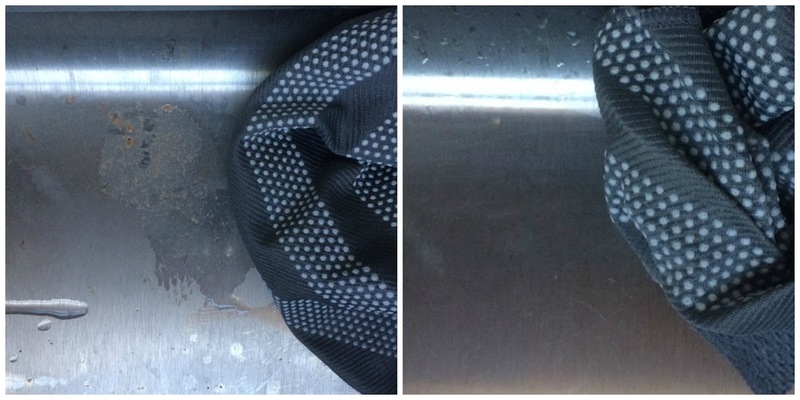 The picture above is my drain sink, which doesn't get cleaned nearly as often as it should...The scrubbing dots took care of that ick quickly! 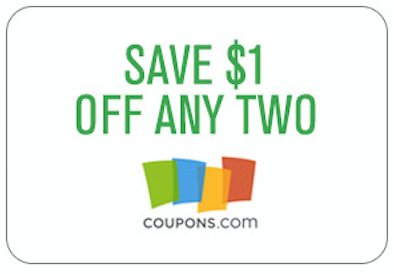 Head to one of the Kroger banner stores and pick up a Scrubbing Dish Cloth today! 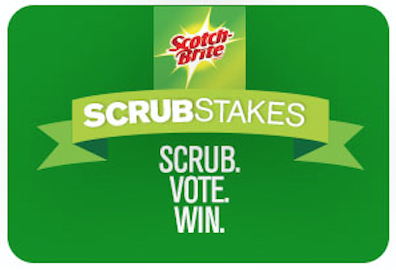 You can learn more about Scotch-Brite™ on their social channels: Facebook, Twitter, Pinterest, and Instagram. 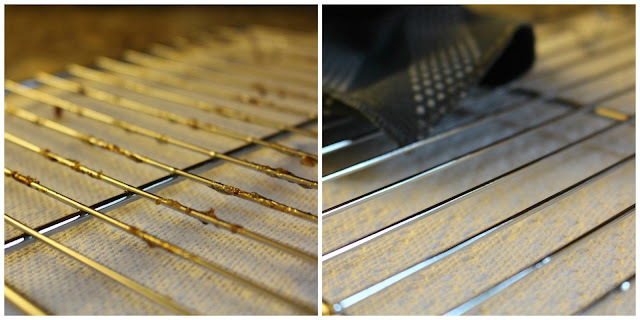 Line two baking sheets with foil and place a wire cooling rack* sprayed with nonstick spray on top of each baking sheet. In a small bowl, mix together the sugar and spices. Add the bacon and toss everything together until the bacon is well coated on all sides. 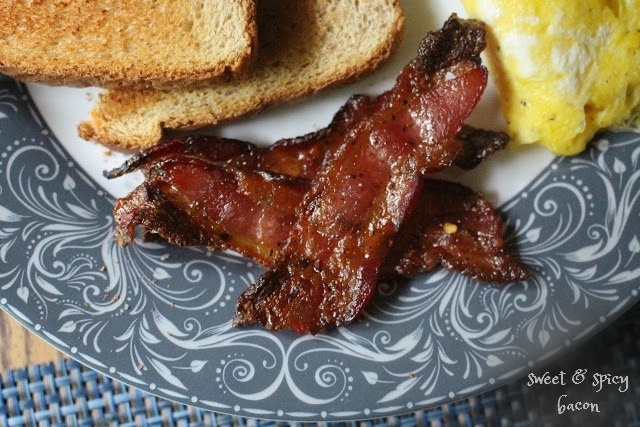 Arrange the bacon slices in a single layer on the racks on the prepared baking sheets. You can place them close together or even touching because they will start to shrink up as soon as they hit the oven. Sprinkle any remaining sugar mixture evenly over the bacon slices. Place the baking sheets in the oven and bake for 12-15 minutes. Check the bacon and continue baking, checking it every couple of minutes. You want the bacon to be a dark golden brown and slightly crisped. The sugar should be bubbly and caramelized. It will bake for around 20-30 minutes total, depending on the thickness of the bacon. Remove the baking sheets from the oven and let the bacon cool on the rack for 5 minutes then transfer it to a serving platter. Be sure to remove the bacon from the rack while it is still warm or it will stick. 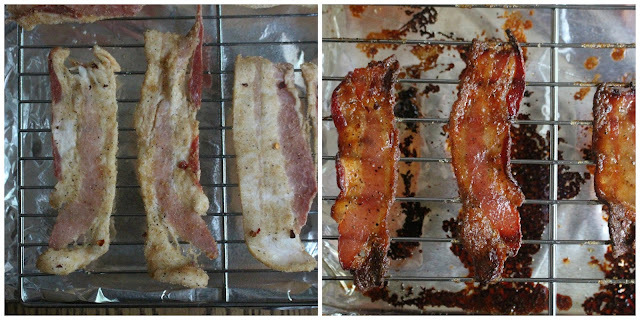 *If you don't have wire cooling racks, you can place the bacon directly on top of the foil, but the wire racks make the most crispy bacon! wow I am drooling over the caramelized bacon and it reminds me that I need to clean my oven! My mom is a dish-cloth kinda gal too. But I am fortunate the my husband does the kitchen cleanup! That bacon is making me drool! Looks delicious! I'm a dish-cloth sort of person too and will be looking for these, never heard of them. Thanks! Never thought to spice up the bacon, looks amazing, will definitely try this Grace, thanks! OK II always thought that when Americans said dish cloths they meant tea towels. I guess it's something else!? YES to bacon in all forms! I always love your product recommendations Grace! Already added these dish cloths to the shopping list, our baking rack is regularly coated in sticky baked-on sweet potato “sap” and my sponge does nothing to help. And oh man, I don’t even want to think about how long it’s been since I scrubbed the kitchen sink drain! First of all, this bacon looks AWESOME! Second, how genius are those dish cloths? I'm a huge cleaning supply nerd (seriously, that's a thing) and I'm totally going to stock up! Happy Tuesday, Grace! You had me at bacon, and I'm a dish cloth girl, too! Looks much gentler on surfaces than steel-wool-type sponges. A very clever new way to clean for sure. Recipes like this change my shopping list every time.